OLD EDINBURG! What a beautiful picture. Mark Gire sent this picture of Edinburg. He found it when going through some of his dads belongings after Lloyd's death. He thinks it was taken about 1910. It was a black and white photo that was hand-painted. It has been reduced down in size so you viewers cannot read all of this information. 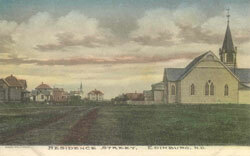 The church in the forefront is St Paul's Lutheran Church. It stood where Beverley Hall lives today. We have "picked out" Leroy and Louise Pederson's home plus what we think was Doc and Dorothy Flaten's home. That is where Bonita Olson lives today. Notice the "old" Trinity Lutheran Church and the wonderful old schoolhouse. What a treasure this picture is. Thank you Mark so much for sharing this with us. This is written from recollections of pioneer stories told, official records and preserved newspaper copies. Coming to this section of Dakota Territory was a Norwegian by the name of Christian Buck. He is known as the "father" of old Edinburgh and the present city of Edinburg. He was acting in the official capacity of Receiver of the U.S. Land Office, and the first postmaster of Edinburgh, being appointed when the office was established on November 1, 1882. The name of the post office and settlement was chosen as a tribute to the university where Mr. Buck received his education. Associated with Christian Buck was another pioneer by the name of Ove Oveson who operated the first store. The post office was also located in the store. At this time the mail had to be carried from the Dundee post office, six miles east of Edinburgh. Charles Buck, half brother to Christian, had a small drug store and gave medical aid to the pioneers. A saloon was operated by 0. Travaaten and a blacksmith shop by 0. Runstad. The exact number of dwellings, at this old site, is uncertain but it is believed some were moved to the new town in 1888. There is one landmark in Edinburg that seems to be generally agreed to have been the office of Christ Buck which was moved in from the old site. That building now stands directly west of the Cenex Station. This building was remodeled and it is now the living room of the Mr. and Mrs. Ronald Monson home. It was the only building in the business area, besides one elevator, to stand after the disastrous fire of 1900. Catherine Paulson sent me this picture of Edinburg in years gone by. I am thinking this is the north side of main street, but I a not sure. I just it looked like the old bank on the left side of the picture. The words written are the "Farmers and Merchants Club" and was taken by O.E. Suby. Thank you Catherine for sending this. About the time the young town was developed, it was hit by the biggest disaster in its history. On April 20, 1900, the entire business section of the town was swept away by a tremendous fire that, in the course of but two hours, consumed every business structure in the village with the exception of Christ Buck's little office building, one elevator and the mill. At the time of the fire, which started at the rear of the Flaten Drug, a strong south wind was blowing spreading and fanning the flames so fast that people had all they could do to vacate the buildings so that very little was saved. Mrs. Julius Bjornson and Mrs. Jacob Lindal, who lived in an apartment over Field's Store (where the bank now stands), perished in the fire. Many homes were also destroyed in the fire. People moved into the Methodist Church (now located in the city park) until their homes could be rebuilt. A large cistern at the corner between the present site of the Edinburg Superette and the vacant lot south of the new fire hall (where the hotel was located) was supposed to serve as fire protection. It was inaccessible because of the rapid spread of the fire.